Highlights from Sworders’ 20th Century Design AUCTION. William Arthur Smith Benson (1854-1924) was not just a designer and manufacturer of brass and copper lighting and other household objects. As demonstrated by the rare, museum-quality side cabinet on offer at Sworders’ 20th Century Design sale in Stanstead Mountfitchet on January 29, he was also a designer of furniture. Benson is known to have produced furniture designs produced by a number of well-known Victorian firms - including Coalbrookdale and Shapland & Petter - but best recorded is his relationship with Morris & Co. The veneered mahogany cabinet with bold Arts and Crafts styled mounts dates from the 1890s - perhaps shortly before Benson became chairman of the firm after the death of William Morris in 1896. Perhaps due to the high cost of production, relatively few pieces are known. The cabinet at Sworders, one of the few to have appeared on the market, carries an estimate of £10,000-15,000. The sale provides a complete cross-section of late 19th and 20th century design from Aestheticism to post-war Scandinavian Modernism. Two pieces typify the enduring appeal of the British Craft movement. An oak gentleman’s dressing table c.1930 by Peter Waals (1870-1937) is estimated at £3000-5000 while, from a later period of the Cotswolds tradition, a beautifully made walnut chest of drawers by Edward Barnsley (1900-87) is expected to bring £5000-8000. Under one of the drawers is the inscription: This chest of drawers was designed by Edward Barnsley 1982 for Christopher H C Edwards and made by the Froxfield Workshop by Oskar Dawson /Edward Barnsley 1983. A strong selection of objects from the Art Deco period includes a very high quality copy of the bone-inlaid and parcel gilt ceremonial chair found in the tomb of Tutankhamen in 1922. A splendid example of ‘Egyptomania’ - the fashion for all things ancient Egyptian that followed Howard Carter’s famous discovery - it dates from c.1925. Bought by Sworders’ vendor for over £25,000, it carries an auction estimate of £10,000-15,000. The vendor of a pair of Clarice Cliff vases received them from her grandmother who recalls purchasing them from the Staffordshire factory c.1930 on the return journey from a summer holiday in Cornwall. The vases the family chose were in the so-called Football pattern - a semi abstract design that today embodies many of the features that Clarice Cliff collectors covet. Although now with damage, the pair are expected to bring £2000-3000. The core of the section of the sale devoted to post-war design comprises both a collection of more than 100 lots of Danish furniture and effects and 70-plus lots consigned by a well-respected London-based dealer who is retiring from business . More from this source will be offered in future sales. 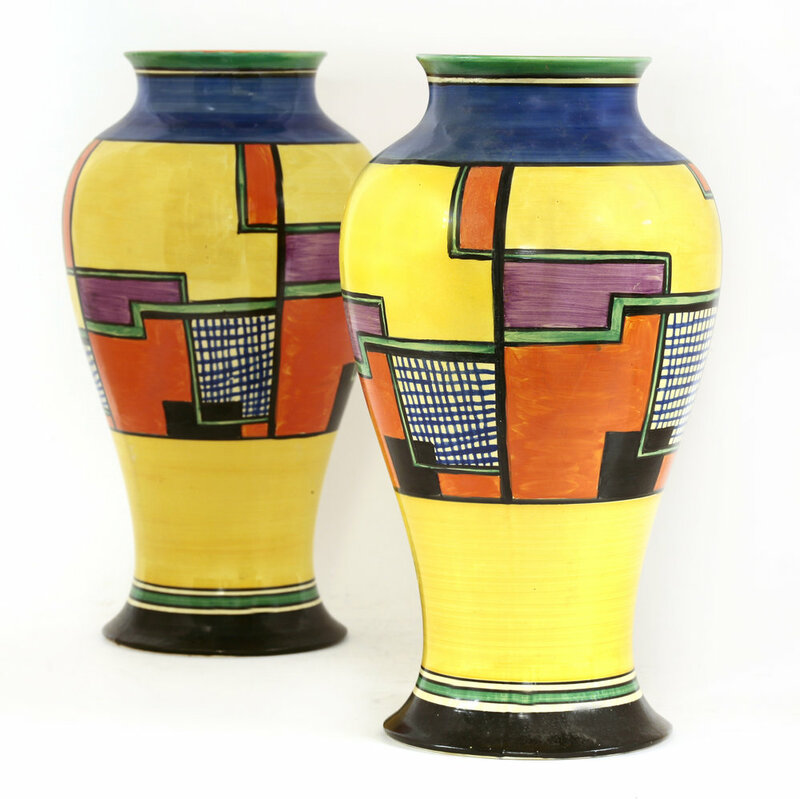 A pair of Clarice Cliff vases in the so-called Football pattern are expected to bring £2000-3000.